Scroll down to find a complete list of workshops, classes and exhibitions by Linda MacAulay in 2019. Learn about watercolour travel diaries, printing with rust, painting, creating quirky creatures and her popular studio workshops on painting techniques. Join her newsletter to be the first to know as new workshops are added for the end of 2019. Demonstration 10:00 am-11:30 am , open to everyone to come and have a look. Some materials provided, but feel free to bring your own. To book a spot, contact Di by May 3rd on 0409 016695. Keeping a visual diary while travelling, helps capture your experience in way that photographs can’t. A drawing or painting created on location instantly takes you back not just to the scene, but the atmosphere, the feeling and memory of actually being there. Come along to the demonstration where Linda will show her collection of travel diaries and demonstrate some basic techniques by painting a small example in watercolour and pen and wash. 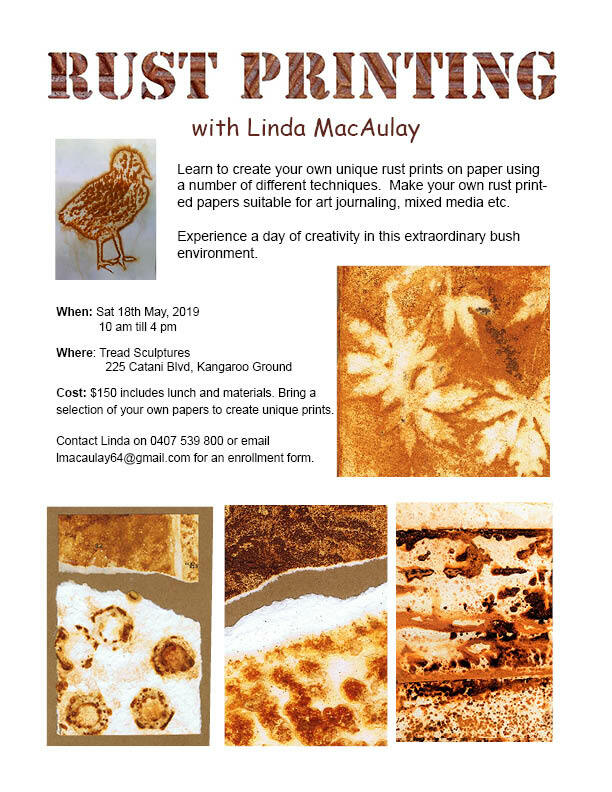 If you feel inspired, join us for the course after the demo where you will be able to put these techniques into practice under Linda’s expert guidance. You will receive comprehensive written notes. How to tell a story through you journal. Rust Printing Workshop at Tread Sculptures. Date: Sunday 19th May – 10:00am to 4:00pm. Bring Lunch. To enrol please visit the link below, scroll down to my workshop and fill in the form on line or ring the number. Working in acrylics and using tonal layering, participants will learn how to create their own unique character portrait. Learn what enables an artist to add a human element and expression to an animal or how to distil the essence of a person for a caricature. If you wish to caricature a person please bring along some photographs of that person. It is better if you bring a few different options. It could be family, friends or a celebrity. You can then choose to do one of the following options on the day. Follow my step by step demonstration. 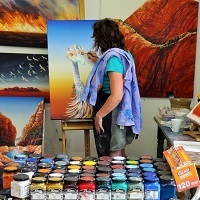 We will be turning a person into an emu so you can work from your own reference photographs or I can provide the reference photographs and you can follow along step by step. If you wish to caricature a person as a different animal please bring along a photograph of the person you wish to paint along with one of the animal in a similar position. There does have to be some similarity for this process to work. It can take a little time to find to find a combination that works well so perhaps bring a variety of options. You will need to bring a canvas….no larger than 40 x 60 cm with the background painted in acrylic ready for us to start painting our caricature. Often simple and uncluttered backgrounds works best. You will also need some brushes …especially a synthetic taklon fan brush and a liner brush. A complete list will be supplied on enrolment. Course notes are provided but please bring a pen and a notebook or paper to make some rough sketches. Please wear old clothes as it can get messy or an apron.